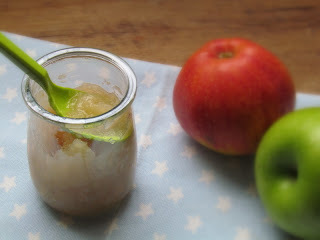 You only need apples and a little bit of water - do not add sugar. Peal, core and chop eight apples (in big chunks). Put them in a pan with little bit of water (4-5 table spoons) Put the pan over medium heat, wait until the water boils, then cover the pan with a lid, reduce the heat to minimum and wait for 5-8 minutes. Then turn the heat off but keep the lid on for 15 minutes more or less. If you want a thin sauce you may want to mix this in a food processor, but we like it with chunks.